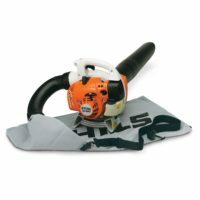 A new fuel efficient STIHL SH 56 C-E Vac / Shredder for occasional users. Powered by a low emissions engine, this handheld shredder vac/blower features the STIHL ErgoStart system, making starting almost effortless. While a specialised shredder blade on the fan wheel reduces garden waste, this shredder vac also converts easily into a handheld petrol leaf blower. Fitted with a semi-automatic choke and stop switch for smooth starts, this blower automatically resets to the starting position to help prevent accidental flooding.